a lot of things had happened since i was here and the most unforgetable moment till now is the EARTHQUAKE...! 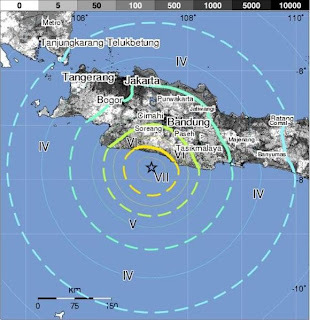 The 2009 Java earthquake was a 7.0 magnitude earthquake that occurred on September 2, 2009 at 14:55 local time in West Java, Indonesia, which killed at least 63 people. Dozens are said to be missing. More than 87,000 homes have been destroyed. The quake was felt in the capital Jakarta although damage here was minimal. Rescue efforts are underway to retrieve those trapped under landslides. It is Indonesia's deadliest earthquake since 2006. At least thirty-two people were initially reported to have been killed by the quake. Buildings in Bandung and Tasikmalaya, the town closest to the epicenter, were damaged, and hundreds of people were injured. An estimated 18,300 homes and offices were earlier thought to have been damaged. This figure later rose to 87,000+. The quake was felt as far away as Jakarta, Indonesia's capital; causing evacuation in many office buildings and hotels. At least 11 houses were covered by a landslide in Cianjur. Around 37 inhabitants, including 13 children, of Cikangkareng were affected by a landslide caused by the quake and are thought to have been buried beneath rubble. The area has become a breeding ground for voyeurs who are flocking to the area to take photographs of the destruction and victims. At least one hospital was destroyed by the quake. i was at class that time, at 6th floor..